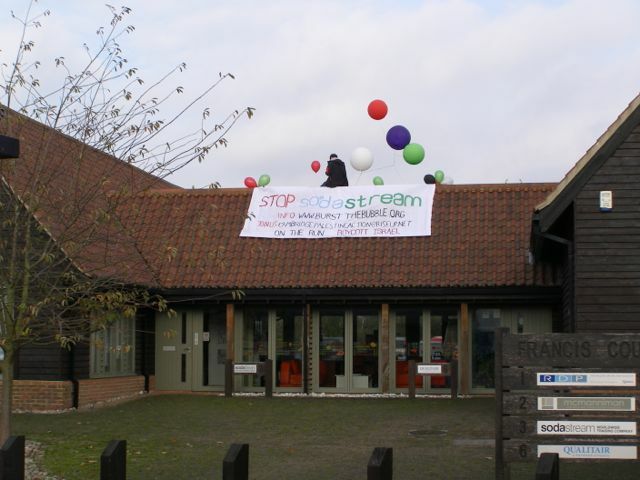 Demonstrators on Soda Stream office on High Ditch Road. The police helicopter was circulating for some time and then landed in a field north of the Soda Stream office. A small group of demonstrators gained access to the rooftop of the Soda Stream office at Francis Court, on High Ditch Road this morning. A leaflet being distributed outside indicated a link to recent announcements in the national press about the location of the SodacStream factory. The police were in attendance is some force and arrested the demonstrators when they came down, after a few hours. All parties seemed in good humour, and there were no reports of injury or damage, although a few tiles may have come loose and a few bubbles popped.